Superlative information design succeeds through precision and clarity – attributes that might bring to mind computer-aided execution and analytical thought. But it also requires designers to engage their intuition about the end-user, and think about how the information they organise visually will be read and interpreted – to provide an accessible way to absorb and understand the facts. This demands a distinctively human perspective, from the emotional side of the brain, as well as sharp thinking. Information design is often impressive for the undertaking of the task alone. Think of the cartography of early explorers; or Phyllis Pearsall’s quest to map the streets of London in 1935, resulting in the first A-Z; or today’s attempts to map the internet (see pages 44-45). 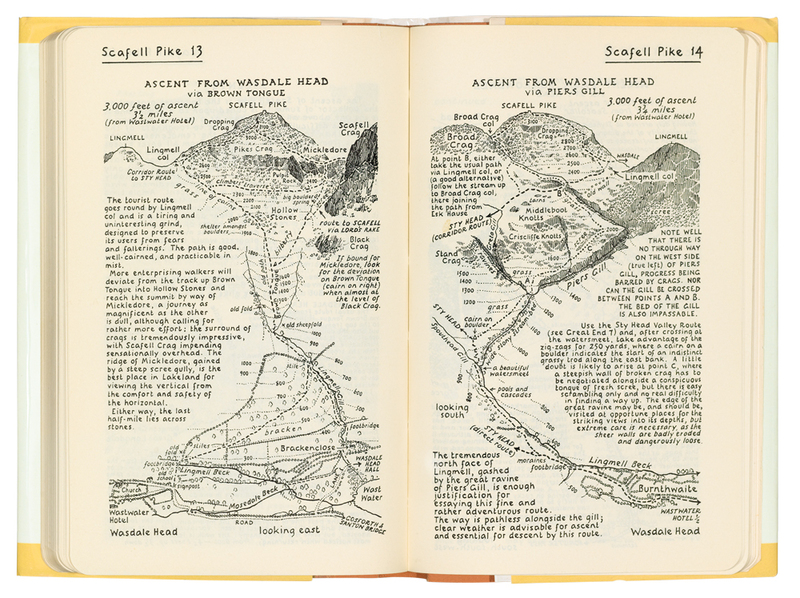 Alfred Wainwright was not a designer, but his remarkable mapping project, A Pictorial Guide to the Lakeland Fells, is loved by designers and walkers alike. Between 1952 and 1966 he documented this part of the English landscape in seven volumes of maps, drawings and written descriptions. He executed every page by hand, texts included. He dedicated thirteen years of his spare time to these books, apparently producing pages at a rate of one per evening; the entire seven-volume epic was planned from the first. 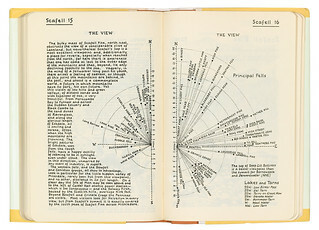 The guide bears the familiar hallmarks and the visual nomenclature of information design – charts, maps, diagrams – but delivered with the warmth of handwritten texts and lovingly executed drawings, all set out on pages composed by eye, housed in pocket-sized books that have the intimacy of a diary. Wainwright knew from experience what a walker needed to know from a guide. 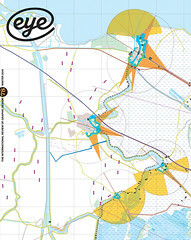 Elaborate maps are combined with annotated views from vantage points, diagrams indicating direction and distance, descriptions of the routes (in his own unmistakable tone of voice) and carefully drawn scenes. Ordnance Survey maps give you terrain, distance and landmarks but the walker’s-eye-view is missing, while the descriptions of paths and landmarks in a written route guide can seem to apply to any or none of the points on your journey. Both can lead to doubling-back and misguided attempts to struggle through impenetrable thickets and barbed wire fences. Yet getting lost can also be part of the fun – something sapped from the experience by GPS devices. Wainwright sits in the middle: superior to the scanty, standard walking guides but with enough left to the ingenuity of the individual walker to provide an adventure. His books are examples of the most human side of information design – precisely, obsessively planned and executed by an autodidact designer who perfectly intuits the end-user’s experience. Each is an indispensable companion through the hazards and triumphs of walking. Initially, the guides were only for his own use and satisfaction. Since publication, however, they have become not only required reading for any walker attempting the fells but also collectable simply as beautiful books. Angharad Lewis is the co-editor of Grafik magazine.